The MAXIMUS IX CODE gives gamers the aesthetic appeal of Aura Sync lighting,the convenience of onboard Wi-Fi,and the reliability of long lasting components. It's christened Code to echo the defining layer of ROG Armor,that protects and streamlines the board. Code has roots in codex,a Latin term describing the precursor to modern books,that became popular due to its unique and durable cover. 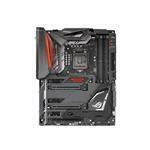 The MAXIMUS IX CODE seeks to set a standard in motherboard design by making ROG Armor more accessible to gamers.